Sign up with GrabRentals and enjoy up to $6,700! 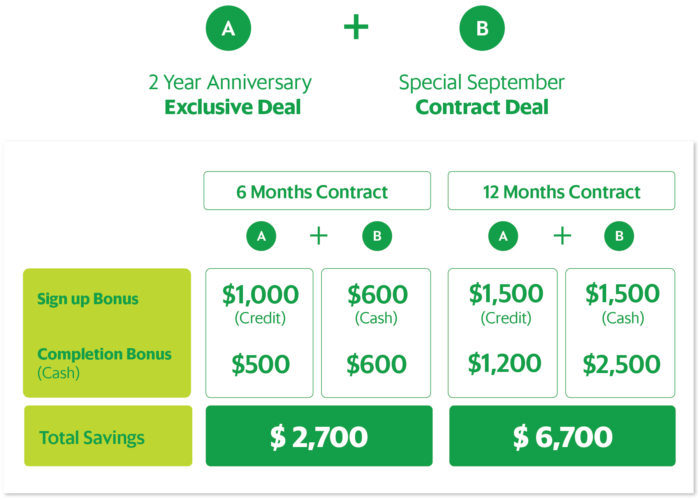 Introducing this month special contract offer with UPSIZED x2 bonuses! For more information on (A), click here. Collect the car before 12 Oct 2018 to be eligible. Bonus will be paid out 100% into driver’s cash wallet. All GC Economy trips count toward the trip requirement targets, including GC 4 seater, 6 seater, Grab Family, GrabShare, GrabAssist, GrabCar Plus and JustGrab. Jobs outside Singapore are not allowed and do no count towards the trip count. Grab reserves the right to withdraw, amend and/or alter any part of the terms & conditions of driver incentives at any time without prior notice.